Cranbook House and Gardens, located in Bloomfield Hills, Michigan, is the oldest historic manor in metropolitan Detroit and serves as the centerpiece of the Cranbrook Educational Community campus, a National Historic Landmark. Formerly the estate of Ellen Scripps and newspaper mogul George Booth, Cranbrook is an English-Tudor house designed in the American Arts and Crafts style by famed Detroit architect Albert Kahn in 1908. The grounds of the house and gardens spans over 40 acres and sees over 5,000 visitors a year. 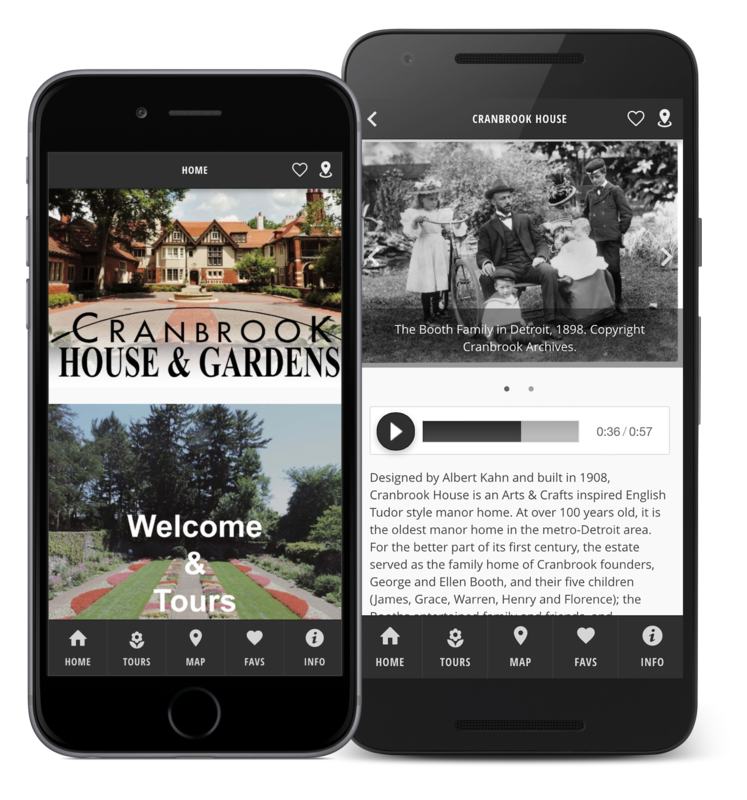 The app provides an audio tour rich with historic imagery and introduces visitors to the history of Cranbrook prior to guiding them through the gardens. Q. What was the main goal for creating an app for the Cranbrook House and Gardens? A. The goal for providing an app was to enhance the visitor experience. Our initial idea was to take our garden tour into the virtual sphere and to help our guests navigate the property. Once we began working with the OnCell app builder we realized there was potential for us to create an all-inclusive app. Q. You launched your app last year and put it on hold for the winter lull. Did you learn any lessons from the previous year and make any adjustments for your spring relaunch? A. The native app wasn’t live until the end of summer last year; as such, we decided to use the remainder of our tour season last year as a soft-launch for testing purposes. As a result of testing we did make some edits to the app, such as slowing down the duration of our image gallery from light speed to one that allows the user to actually see each image! We changed the design of the app homepage this year to make it more visually inviting and mobile friendly, and also incorporated OnCell’s new ‘Favorites’ function. Q. How has the app been received by visitors and colleagues? A. Our app was just announced to the public in late-May, but so far it has been well received. I spoke with two guests yesterday who were visiting from out of state, they told me they were in front of one of our sculptures and wanted to know more about it, so they opened the app and found exactly what they were looking for. The beta team of members and colleagues that helped us test the app during the soft-launch last year were really impressed with the app and all of its features. 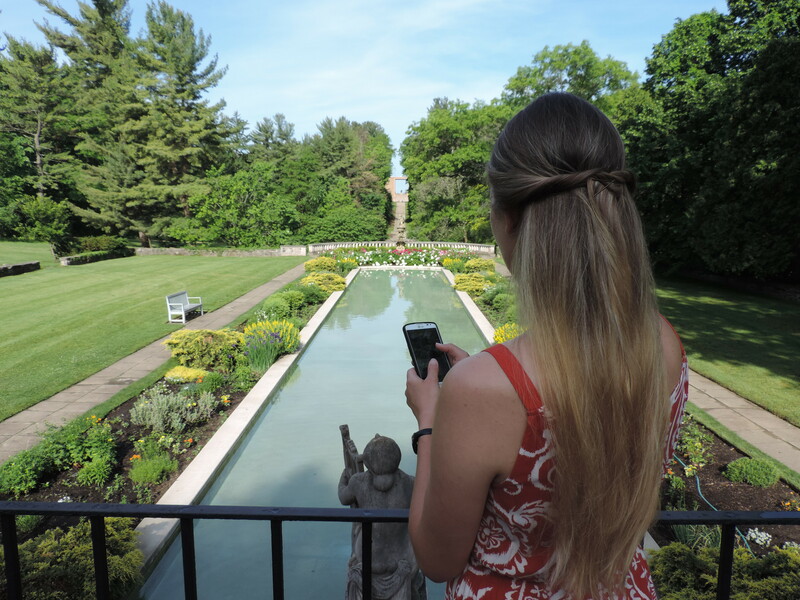 Standing above the reflecting pool, a visitor uses the Cranbrook House and Gardens mobile app to tour the gardens. Q. How does your organization promote the app and encourage its use? A. We promote the app and encourage its use through a press release announcement to media, email announcement to the public, inclusion on our website, social media postings, onsite signage, inclusion in our Visitor Guide & Map brochures, and informational rack cards. Q. The app looks great–nicely curated with both modern and archival images along with wayfinding info. How long did it take your team to gather the content and publish your app? A. Thank you! It took us about two months of researching archival databases, scripts, and other information to gather the tour content, and another one to two months to design the app. The biggest challenge was trimming all of the content gathered into an amount acceptable for display on a mobile device; Cranbrook has such a rich history! Q. Do you have advice for other orgs that may be interested in developing an app? A. Have fun with it, be creative, and think about how you want the app to be structured before you begin building pages. Q. What are the next steps in your organization’s visitor engagement strategy? A. We plan to continue to find creative ways for the app to improve visitor engagement. In addition to the app tours, we may add one or a few scavenger hunts of varying difficulty. New technologies such as push notifications that could give us the possibility of alerting users of what’s in bloom each week are currently being explored as well. ← We’re featured in the Democrat & Chronicle!